DURATION: 15 MAY 2019 TO 27 MAY 2019. We seek your assistance to arrive by 15 May 2019 to enable sufficient time to learn on the procedures as well as ordination scripting. Through sincere practice, enormous merits are acquired. Nothing equals to self-practice. Let us share these merits with gratitude to the Buddha, Dhamma and Sangha, our parents, ancestors and kammic debtors. Being reborn life after life, we may not be aware of the past actions we have done in the past. We aspire to transfer our merits through this practice to our kammic debtors (beings whom we have wronged in the past). May they rejoice in the merits and forgive us. May the merits we shall acquire bring happiness and comfort. May all beings be well and happy. 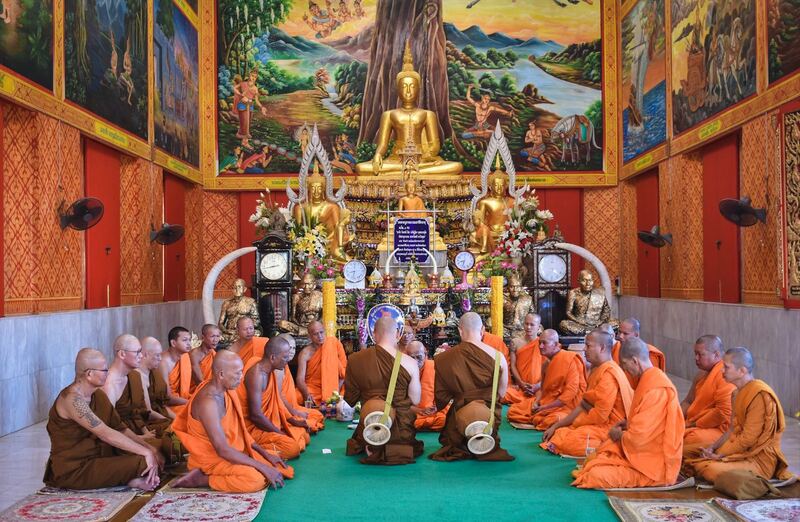 There would be formal Bhikkhu (monk), Samanera (novice ภิกขุ) and Mae Chees (nuns แม่ชี) ordination. Others may also choose to observe 8 precepts. For those who are planning to ordain, the latest arrival date is 15 May 2019. For disrobing, there are 2 dates: earliest on 25 May (night) or later on 27 May (morning). Arrival: To buy air ticket to arrive in Bangkok (Don Meung or Suvarnabhumi) not later than Wednesday 15 May 19. Departure: To fly back from Bangkok on earliest Sunday 26 May (for those disrobing on 25 May) or later on Monday 27 May evening flight. Pickup would be via the airport (Don Meung or Suvarnabhumi). Please note that the program may be subjected to change due to unforeseen circumstances. The detailed program would be provided to participants at the temple after arrival. 18 May 2019 (Saturday) Wesak Day – chanting, lighting of candles and paying respect to the Buddha. 27 May 2019 (Monday) Disrobing ceremony. Note: For those who are unable to stay till 27 May 2019, the disrobing ceremony can be done earlier on night of 25 May (to enable you to book a flight on 26 May 19). Q: I would to attend this event. What do I need to do? A: Please let us know if you would like to undergo ordination (monk, novice or nun) or as 8 preceptor. Do note that for those who wish to ordain as monks, we would be requesting for detailed particulars from each participant for submission including passport and background information. Q: How do I get from the temple from the airport? A: Khun Mae would arrange for someone to pick you up from the airport. Therefore we would require information on how many pax, flight number, date and time of arrival and at which airport (Don Meung or Suvarnabhumi airport). Q: Do I need to bring anything along with me? A: Upon confirmation, all your requisities (robes, almsbowl, blanket, etc) would be prepared for you. For 8 preceptors, if you do not have the 8 precept attire you may purchase from the temple. Q: I am a vegetarian. Does the temple provide vegetarian food? A: Arrangement can be made for vegetarian food to be cooked for you. Usually, we would have a few practitioners who are vegetarians. Please notify us in advance to enable us to do the necessary preparation. Q: The program’s duration is about 2 weeks. However, I am not able to make it for the complete 2 weeks. Can I come for just a few days in between? A: For this event as there may be travelling involved, we seek your assistance to book within the dates to ensure that you would be able to join us. For those who wish to ordain as a monk or novice, you would need be available from 15 May to 27 May 2019 (evening flight). Alternatively you may contact Khun Mae to check if alternative arrangements can be made. .
Or you may leave a comment below with your details (comment would not be published but we would respond back to you via email). You may sign up to receive notification and updates via email .